As the Internet and broadband services continue to evolve, the range of applications grows wider and more bandwidth intensive. A range of broadband access products offered by UTStarcom gives an operator the flexibility to provide required services to his customer in the most efficient manner. Options include Broadband Wireless Access for plain wireless access and for sophisticated Wi-Fi offloading applications, FTTx for various types of deployment, and MSAN NGN platform for converged triple-play access. The variety of technologies used by network operators to serve their customers and provide access to Internet, cloud services, IPTV and other resources creates a truly multi-service and multi-technology networking environment. An efficient, scalable and seamlessly interoperating access and aggregation network becomes one of the key factors to success of a network operator. Broadband aggregation systems need to be adequately provisioned and ready to handle the rapid growth of bandwidth demand. They should be capable of aggregating multiple GE/10GE interfaces from broadband access platforms and connect with the core networks via high-speed interfaces like 100GE. The systems need to be scalable, resilient, reliable, capable of handling multicast video traffic and able to handle VLANs to ensure secure service provisioning and management as per subscriber requirements. 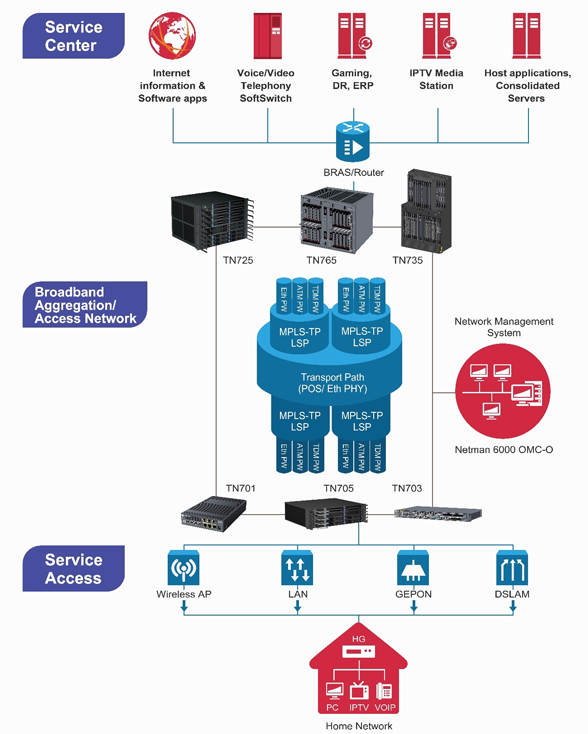 MPLS-TP / CE based Packet Optical Networks provide an ideal solution for operator broadband aggregation needs, particularly given that bandwidth requirements are increasing every day. The capability to provide service aware transport and an MPLS based QoS mechanism creates a very powerful solution to handle different primary applications (voice, video or data) according to their respective priorities. A highly scalable architecture and a variety of interfaces enable service providers to roll out new revenue generating services quickly and efficiently. Learn more about Broadband Access products.